The Neuschwanstein Castle, also called Germany´s fairytale castle, is located above the village of Hohenschwangau in the district of "Ostallgäu", nearby the Austrian border. It was commissioned by Ludwig II of Bavaria in honor of his friend Richard Wagner and as a "haven" for Ludwig himself. After the Bavarian king had lost sovereignty in his own kingdom, he escaped into his own world of myths, legends and fairytales. Therefore, King Ludwig II of Bavaria is known as the "Märchenkönig" which means in English "Fairy Tale King" due to his obsession with fairy tales and myths. 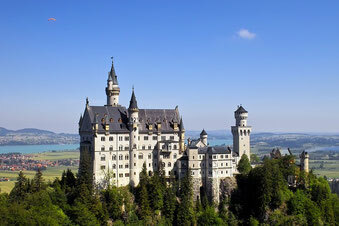 Neuschwanstein Castle is a global symbol of the era of Romanticism and was an inspiration for Walt Disney. The term Romanticism stands for an artistic, literary and musical movement that originated in Europe toward the end of the 18th century. Neuschwanstein Castle´s architectural fashion is also known as "Burgenromantik" which means "castle romanticism". The cathedral officially bears the name Cathedral Church of Saint Peter and is a catholic cathedral in Cologne, a vibrant city in North Rhine-Westphalia. Its construction began in 1248 and was intended to be a place of worship for the Holy Roman Emperor. In the early 16th century construction was stopped due to lack of money. In 1842 King Friedrich Wilhelm IV, who ruled Prussia from 1840 until his death, ordered the continuation of building work. The cathedral was finished in 1880 without leaving the original plan of 1248. 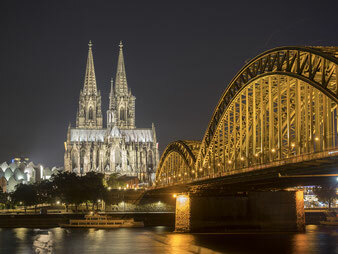 The Cologne Cathedral is a symbol for Gothic masterpiece. It survived all World Wars. Today, the main factors that are a affecting the cathedral are mainly weather influences. 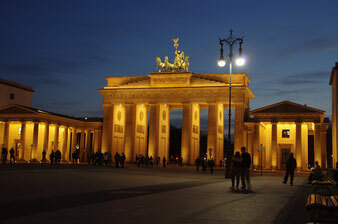 The Brandenburg Gate is a 18th century neoclassical monument. The neoclassical architecture is a style which derived from the architecture of classical antiquity. It was constucted between 1788 and 1791 by Prussian King Frederick William II. The monument has become Germany´s national symbol for both, its tumultous history as well as for its reunification. The statue "Quadriga" on top of the gate was taken to Paris by Napoleon after he had occupied the city. It was taken back to Berlin after the German army captured Paris in 1814. John F. Kennedy gave his famous "I am a Berliner" speech in June 1963 at the Brandenburg Gate to express his sympathy for West Germany. 24 years later, also Ronald Reagan addressed West Germans here to express his support for the city. Berlin itself played an important role in German American history after WW II. Other sights are Checkpoint Charlie and numerous museums. Trier is located at the banks of the Moselle, a river flowing through France, Luxembourg and Germany where it joins the Rhine in Koblenz. 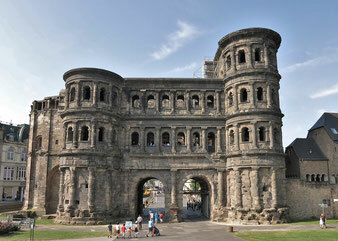 Trier is known as the oldest city in Germany. It was founded by the Celts in the late 4th century BC and later conquered by the Romans who named the city Augusta Treverorum which means in Latin "The city of Augustus among the Treveri). There are many Roman sights to explore in the city such as ruins of Roman baths or the Porta Nigra, one of the best-preserved Roman city gates north of the Alps. Trier is located in a famous German whine region and a train ride along the Moselle, starting from Koblenz, is a great experience to discover this part of Germany. Rothenburg ob der Tauber is a well-preserved medieval old town located in the heartland of Franconia in the district of Ansbach. 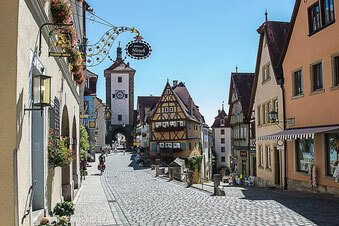 The town is also known as Germany´s fairy-tale town and is part of the Romantic Road, a "theme route" of 220 miles (350 kilometers) between Würzburg in Lower Franconia and Füssen in southern Germany. Since there are several "Rothenburgs" in Germany, you should plan for the one on the Tauber river. Besides great medieval style houses and fine German cuisine, there is the Medieval Crime and Punishment Museum and the Christmas Museum.